Podcast Publisher allows users to create as many shows as they want and within each show they can have episodes. Podcast Publisher lets you capture video and/or audio for your show, and you can even record your Mac’s screen in realtime if you want to demo something. You can even do some quick iOS-like editing of your clips (“trimming”) and the whole feel of the application is very user-friendly. 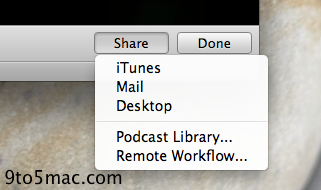 Once your podcast episode is complete you can export it as a file to your desktop, iTunes, or an e-mail. You can also easily send it to your Podcast library’s server or remote workflow. We think Podcast Producer is something a lot of people will use, as Apple’s is yet to implement a true podcast creation tool in Mac OS X for use by anyone. If you’ve worked with OS X Lion and have had the opportunity to check out Apple’s new Podcast Publisher, leave a comment with your thoughts!